FAQs on 'Clubbing of Income' under Income Tax Act. ​Do any clubbing provisions exist in case of transfer of income without transfer of asset? ​Do any clubbing provisions exist in case of a revocable transfer? ​Can remuneration received by spouse of an individual be clubbed with his/her income? ​Can income from assets transferred to spouse without adequate consideration be clubbed with the income of transferor-spouse? ​Are there any situations in which the clubbing provisions do not apply in case of income from assets transferred to spouse? ​Can income from assets transferred to son’s wife without adequate consideration be clubbed with the income of transferor, i.e., father-in-law/mother-in-law? ​Is minor child’s income clubbed with the income of parent? ​Will any clubbing provision apply in case of transfer of asset to Hindu Undivided Family (HUF) by its member? 1. What is the meaning of clubbing of income? ​​​Normally, a person is taxed in respect of income earned by him only. However, in certain special cases income of other person is included (i.e. clubbed) in the taxable income of the taxpayer and in such a case he will be liable to pay tax in respect of his income (if any) as well as income of other person too. 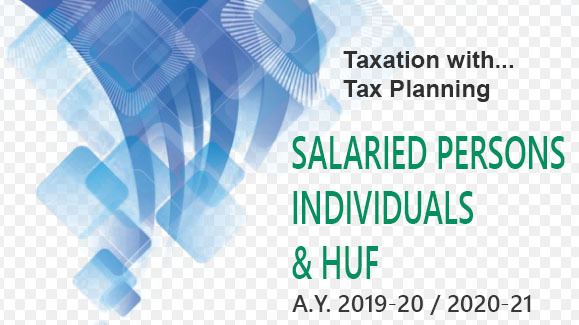 The situation in which income of other person is included in the income of the taxpayer is called as clubbing of income. E.g., Income of minor child is clubbed with the income of his/her parent. Section 60 to ​64 ​ give various provisions relating to clubbing of income. ​2. Do any clubbing provisions exist in case of transfer of income without transfer of asset? ​​​​​ As per section 60 ​​, if a person transfers inco​me from an asset owned by him without transferring the asset from which the income is generated, then the income from such an asset is taxed in the hands of the transferor ( i.e., person transferring the income). ​3. Do any clubbing provisions exist in case of a revocable transfer? ​​​Revocable transfer is generally a transfer in which the transferor directly or indirectly exercises control/right over the asset transferred or over the income from the asset. ​4. Can remuneration received by spouse of an individual be clubbed with his/her income? The individual is having substantial interest in a concern (*). Spouse of the individual is employed in the concern in which the individual is having substantial interest. The spouse of the individual is employed without any technical or professional nowledge or experience ( i.e., remuneration is not justifiable). (*) An individual shall be deemed to have substantial interest in any concern, if such individual alone or along with his relatives beneficially holds at any time during the previous year 20% or more of the equity shares (in case of a company) or is entitled to 20% of profit (in case of concern other than a company). Relative for this purpose includes husband, wife, brother or sister or lineal ascendantor descendent of that individual [ section 2( 41 ) ]. Mr. Raja is beneficially holding 21% equity shares of Essem Minerals Pvt. Ltd. Mrs. Raja is employed as Manager (in accounts department) in Essem Minerals Pvt. Ltd. at a monthly salary of Rs. 84,000. Mrs. Raja is not having any knowledge, experience or qualification in the field of accountancy. Will the remuneration ( i.e., salary) received by Mrs. Raja be clubbed with the income of Mr. Raja? In this situation, Mr. Raja is having substantial interest in Essem Minerals Pvt. Ltd. and remuneration of Mrs. Raja is not justifiable ( i.e., she is employed without any technical or professional knowledge or experience) and, hence, salary received by Mrs. Raja from Essem Minerals Pvt. Ltd. will be clubbed with the income of Mr. Raja and will be taxed in the hands of Mr. Raja. Mrs. Kumar is beneficially holding 25% equity shares of SM Construction Pvt. Ltd. Mr. Kumar is an architect and he is employed as site observer of one of the construction sites of the SM Construction Pvt. Ltd. at a monthly salary of Rs. 28,400. The remuneration received by Mr. Kumar is justifiable considering his knowledge, experience and qualification. Will the remuneration received by Mr. Kumar be clubbed with the income of Mrs. Kumar because she is having substantial interest in SM Construction Pvt. Ltd.? ​5. Can income from assets transferred to spouse without adequate consideration be clubbed with the income of transferor-spouse? ​​As per section 64(1)( iv ) , if an individual transfers (directly or indirectly) his/her asset (other than house property) to his or her spouse otherwise than for adequate consideration, then income from such asset will be clubbed with the income of the individual ( i.e., transferor). Income from transfer of house property without adequate consideration will also attract clubbing provisions, however, in such a case clubbing will be done as per section 27 ​ and not under section 64(1)( iv ) . The clubbing provisions of section 64(1)( iv ) will apply even if the form of asset is changed by the transferee-spouse. There are certain situations in which the clubbing provisions of section 64(1)( iv ) are not applicable (refer next FAQ for these situations). In this situation, the debentures are transferred to spouse. Transfer is via gift ( i.e., without any consideration) and, hence, income generated from the transferred asset, i.e., interest on such debentures will be clubbed with the income of Mr. Soham. Rs. 8,40,000 is transferred to spouse. Fund is transferred via gift ( i.e., without adequate consideration) and, hence, the provisions of section 64(1)( iv ) will be attracted. The provisions of clubbing will apply even if the form of asset is changed by the transferee-spouse. ​6. Are there any situations in which the clubbing provisions do not apply in case of income from assets transferred to spouse? ​7. Can income from assets transferred to son’s wife without adequate consideration be clubbed with the income of transferor, i.e., father-in-law/mother-in-law? ​​As per section 64(1)( vi )​ ​, if an individual transfers (directly or indirectly) his/her asset to his/ her son's wife otherwise than for adequate consideration, then income from such asset will be clubbed with the income of the individual ( i.e., transferor being father-in-law/mother-in-law). The provisions of clubbing will apply even if the form of asset is changed by the transferee-daughter-in-law. If the asset is transferred before marriage of son, no income will be clubbed even after marriage, since the relation of father-in-law/mother-in-law and daughter-in-law should exist both at the time of transfer of asset and at the time of accrual of income. ​​As per section 64(1)(vii) , if an individual transfers (directly or indirectly) his/her asset otherwise than for adequate consideration to a person or an association of persons for the immediate or deferred benefit of his/her spouse, then income arising from the asset so transferred will be clubbed with the income of transferor. ​9. Is minor child’s income clubbed with the income of parent? ​​As per section 64(1A) , income of minor child is clubbed with the income of his/her parent (*). Income of minor child earned on account of manual work or any activity involving application of his/her skill, knowledge, talent, experience, etc. will not be clubbed with the income of his/her parent. However, accretion from such income will be clubbed with the income of parent of such minor. Income of minor will be clubbed along with the income of that parent whose income (excluding minor's income) is higher. If the marriage of parents does not sustain, then minor's income will be clubbed with the income of parent who maintains the minor. In case the income of individual includes income of his/her minor child, such individual can claim an exemption under section 10(32) ) of Rs. 1,500 or income of minor so clubbed, whichever is less. (*) Provisions of section 64(1A) will not apply to any income of a minor child suffering from disability specified under section 80U . In other words income of a minor suffering from disability specified under section 80U will not be clubbed with the income of his/her parent. Income of B from bank interest: Rs. 1,20,000. Will the income of minor children be clubbed with the income of their parent (Mrs. Raja is not having any income)? As per section 64(1A) , income of minor children is clubbed with the income of that parent whose income (excluding minor's income) is higher. In this case, Mrs. Raja is not having any income and, hence, if any income is to be clubbed then it will be clubbed with the income of Mr. Raja. Income of minor child earned on account of manual work or income from the skill, knowledge, talent, experience, etc., of minor child will not be clubbed with the income of his/her parent. Thus, income of A from stage show will not be clubbed with the income of Mr. Raja but income of A from bank interest of Rs. 6,000 will be clubbed with the income of Mr. Raja. Income of a minor suffering from disability specified under section 80U ​ will not be clubbed with the income of his/her parent. Hence, any income of B will not be clubbed with the income of Mr. Raja. ​10. Will any clubbing provision apply in case of transfer of asset to Hindu Undivided Family (HUF) by its member? Before partition of the HUF, entire income from such property will be clubbed with the income of transferor.